Next week Terry Gilliam will receive the Festival’s annual Raindance Auteur Award, recognizing his achievements in filmmaking and ongoing contribution to the film industry. The award will be presented by Raindance Festival Founder, Elliot Grove, on Wednesday, August 22nd, 2018, at an evening soiree hosted by The Dorchester Hotel in London. The full festival programme for the 26th Raindance Festival will be announced that morning at Vue West End. After directing his fellow Pythons in Monty Python and the Holy Grail, and Meaning of Life, Terry Gilliam went on to write and direct films including Jabberwocky, Time Bandits, and Brazil starring Jonathan Pryce and Robert De Niro, which was nominated for an Academy Award for Best Screenplay. After directing the Oscar-nominated The Adventures of Baron Munchausen, Terry went on to direct three Americana films: the Oscar-winning The Fisher King starring Robin Williams and Jeff Bridges; 12 Monkeys starring Brad Pitt and Bruce Willis; and Fear and Loathing in Las Vegas, based on the book by Hunter S. Thompson. Terry has also turned his hand to opera — directing Berlioz’s The Damnation of Faust at the English National Opera as well as Berlioz’s Benvenuto Cellini. Terry brought his distinctive style to his recent films The Zero Theorem starring Christoph Waltz and Tilda Swinton and the star-studded The Imaginarium of Dr Parnassus, well known as the last feature film Heath Ledger starred in before his death. But for me? It’s always going to be Tideland. The coalescence of the corn in the field with the waves of the ocean, the sound of one playing as the other, and the rocking back and forth of the horizon is possibly my favourite cinematic moment ever. So yeah. Private event. Limited tickets available here. My blagging skills may have to go up a notch. 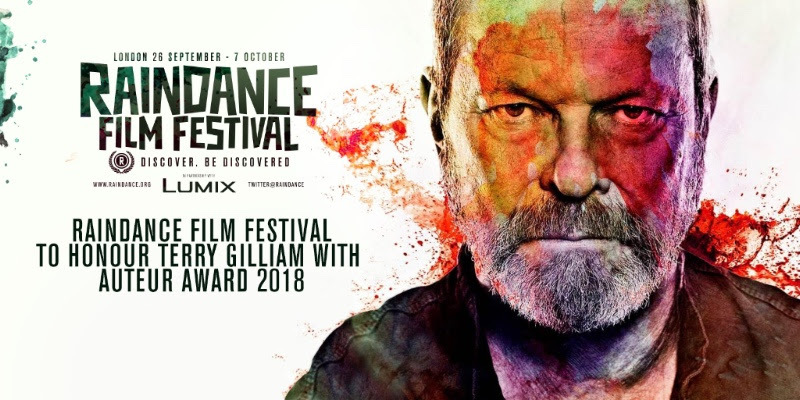 The 26th Raindance Film Festival will take place from September 26th–October 7th, 2018 in London’s West End and will screen a selection of UK and international features, documentaries, shorts, web series, music videos and virtual reality experiences. The Festival will announce its full festival programme at Vue West End on August 22nd, 2018. Festival passes can be purchased through the Festival website.